Last few days here have involved getting some really interesting intelligence from selected Indian ministries on investment by the country’s NOCs, India’s possible action against Iranian crude imports, rising consumption patterns and a host of other matters. However, to get to the said officials during rush hour, you have to navigate through one of the worst traffic in any Asian capital. Furthermore, rush hour or no rush hour, it seems Delhi’s roads are constantly cramped. It takes on average an hour to drive 10 miles, more if you happen to be among those on the road during rush hour. It often pains to see some of the fastest cars on the planet meant to bring the thrill of acceleration to the Indian driver’s foot pedal, doing 15 mph on the Capital’s streets. They say Bangkok has Asia’s worst traffic jams – the Oilholic thinks ‘they’ have not been to Delhi. Away from the jams, chats with officials threw up some interesting stuff. India currently permits 100% investment by foreign players only in upstream projects. However, the government is putting through legislation which would raise the investment ceiling for other components of the oil & gas business including raising investment cap in gas pipeline infrastructure to 100 per cent. What India does, matters both to it as well as the wider oil & gas community. The country has some 14 NOCs, with four of them in the Fortune 500. As the Oilholic noted at the 20th World Petroleum Congress, over a period of the last 12 months, Indian NOCs have invested in admirably strategic terms but overseas forays have also seen them in Syria and Sudan which is politically unpalatable for some but perhaps ‘fair game’ for India in its quest for security of supply. It also imports crude from Iran. Together with China, Indian crude consumption heavily influences global consumption patterns. US EIA figures suggest Indian crude consumption came in at 300,800 barrels per day (bpd) in 2009 while local feedback dating back to 2010 suggests this rose to 311,000 bpd by 2010. Being a massive net importer – sentiment goes right out of the window whether it comes to dealing with Iran or Sudan, and India's NOCs are in 20 international jurisdictions. Over days of deliberations with umpteen Indian officials, not many, in fact any were keen on joining the European oil embargo on Iran. However, some Indian scribes known to the Oilholic have suggested that in the event of rising pressure, once assurances over sources of alternative supply had been met, the government would turn away from Iran. In the event of financial sanctions, it is in any case becoming increasingly difficult for Indian NOCs to route payments for crude oil to Iran. No comment was available on the situation in Sudan or for any action on Syria. In case of the latter, many here are secretly hoping for a Russian veto at the UN to prevent any further action against the Assad administration but that view is not universal. Speaking of Sudan, the breakaway South Sudan shut its oil production on Sunday following a row with Sudan. It is a major concern for India’s ONGC Videsh Ltd (OVL) – which has the most exposure of all Indian companies in Sudan. Oil production makes up 98% of newly independent South Sudan's economy and OVL has seen its operations split between North and South Sudan. Amid rising tension, the real headache for OVL, its Indian peers and Chinese majors is that while South Sudan has most of the crude oil reserves, North Sudan has refineries and port facilities from which exports take place to countries like India and China. It’s no surprise that the latest row is over export fees. If the dispute worsens, Indian analysts, oil companies and the UN Secretary General Ban Ki-moon are near unanimous in their fear that it could become a major threat to stability in the region. The Oilholic notes that while all three have very different reasons for voicing their fears – it is a clear and present danger which could flare up anytime unless sense prevails within the next four weeks. South Sudan's oil minister Stephen Dhieu Dau told Reuters on Sunday that all production in his landlocked country had been halted and that no oil was now flowing through Sudan. "Oil production will restart when we have a comprehensive agreement and all the deals are signed," he added. Earlier on January 20th, Sudan seized tankers carrying South Sudanese oil, supposedly in lieu of unpaid transit fees. On Saturday, Sudan said it would release the ships as a “goodwill gesture” but South Sudan said this did not go far enough. UN Secretary General Ban accused the leaders of Sudan and South Sudan of lacking "political will" and specifically urged Sudanese president Omar Al-Bashir to "fully co-operate with the United Nations". Doubtless he’ll respond to it just as he did to the issuance of his arrest warrant by the International Court of Justice in 2009! The world is watching nervously, as is India for its own crude reasons. On the pricing front, Brent and WTI closed on Monday at US$110.98 and US$98.95 a barrel respectively, with decidedly bearish trends lurking around based on renewed fears of a chaotic default in Greece and EU leaders’ inability to reach a consensus. Unsurprisingly the Euro also lost ground to the US dollar fetching US$1.31 per Euro. Jack Pollard, analyst at Sucden Financial, says the fear that CDS could be triggered in a hard Greek default could look ominous for crude prices, especially in terms of speculative positions. “Continued Iran tensions should help to maintain the recent tight range, with a breakout only likely when there is a material change in dynamics. Whether Iran or Greece produces this (change) remains to be seen,” he adds. Last but not the least, reports from Belize – the only English-speaking Central American nation – suggest the country has struck black gold with its very first drill at the onshore Stann Creek prospect currently being handled by Texan firm Treaty Energy. Abuzz with excitement, both the government and Treaty believe the Stann Creek prospect has yet more surprises to offer with two more exploratory wells on the cards fairly soon pending permit requests. That’s all for the moment folks, keep reading keep it ‘crude’! © Gaurav Sharma 2012. 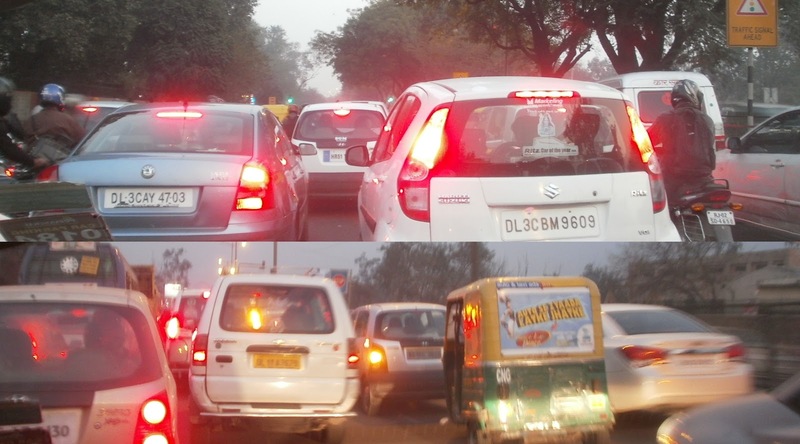 Photo: Glimpses of Delhi's mega traffic Jams © Gaurav Sharma 2012.